Short on time? 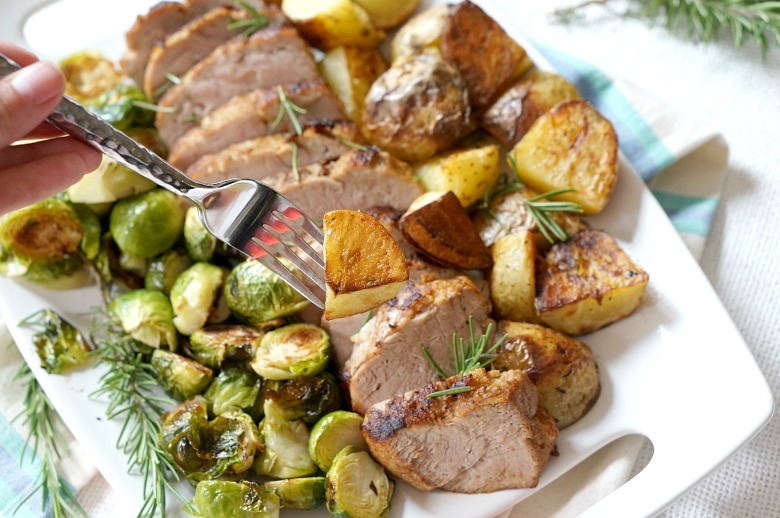 Skip the searing of the pork tenderloin and put it straight in the oven with the brussels sprouts and potatoes. 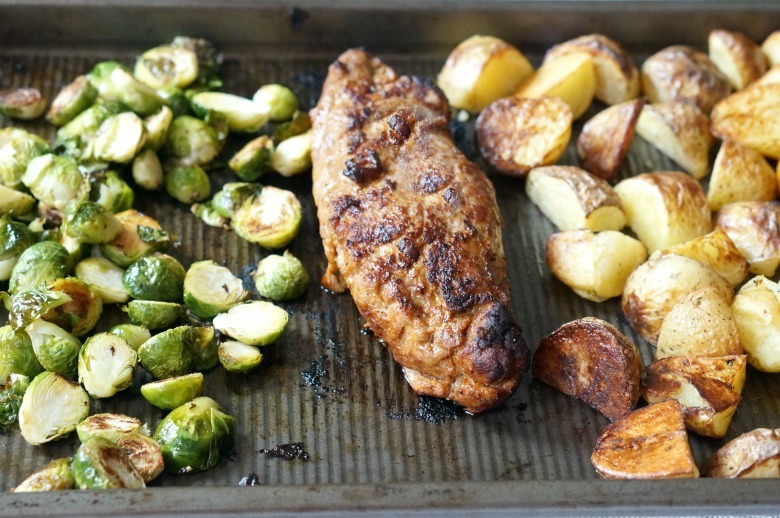 Then you’ll only have just one pan for clean up with our Sheet Pan Pork Tenderloin Dinner! Feeling in a rush these days? Me too. The whole family is in overdrive trying to figure out school schedules, after school activities and who’s where, when. There’s a lot of moving pieces and not a lot of down time. Which is why family dinner is more important than ever. Sometimes I get to make dinners with multiple ingredients and that take some time to coax flavor out of. But mostly, I’ve got 30 minutes or less and I’m not spending a lot of time on prep or cleanup. Which is why Smithfield Marinated Fresh Pork is my back-to-school go to. 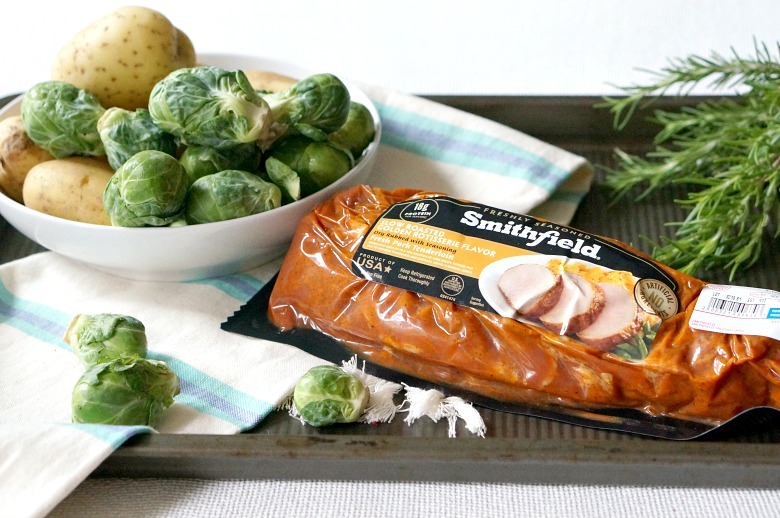 If you know what I’m talking about, then you’ll want to share your original dinner time-saving tip or trick that includes Smithfield Marinated Fresh Pork product in one of these three categories (Meal Prep, Cooking Method, Fresh Pairings) to be entered to win a trip Wine Country. Enter here by August 31st! 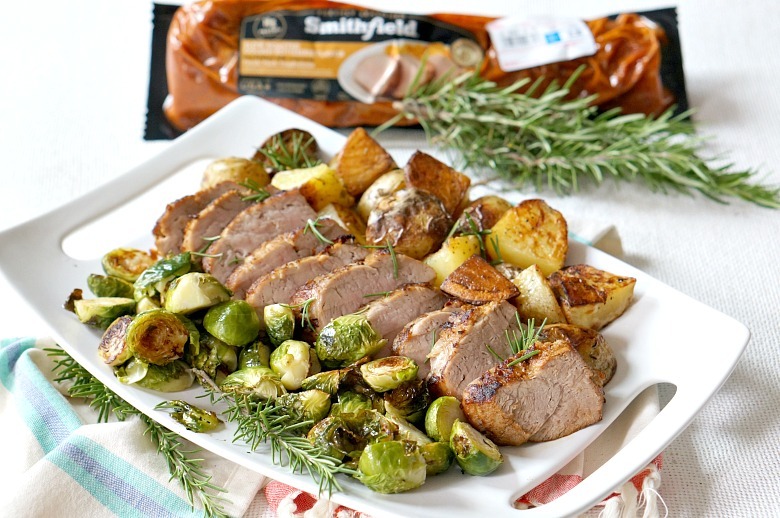 Our Sheet Pan Pork Tenderloin Dinner stars Smithfield Slow Roasted Golden Rotisserie Flavor Pork Tenderloin. 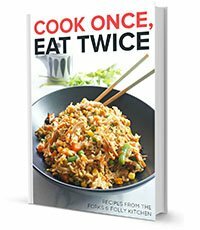 With all-natural ingredients including pork broth, vinegar, salt and spices, no fancy vinaigrettes, dressings or glazes are needed. I start this meal out by searing the pork tenderloin in a hot skillet before it goes in the oven. Just drizzle a little olive oil in a large pan, bring it to medium high heat, then brown the meat on all sides. BUT… if you wanna skip that part, you totally can! Hey, it’s all about getting dinner on the table. I get it. So, whether you brown the meat first or not, preheat the oven to 425 degrees Fahrenheit. Toss the quartered potatoes with a drizzle of olive oil, salt and pepper. Scatter on one third of the baking sheet. Place the pork in the middle, and on the other side, toss the halved brussels sprouts with another drizzle of olive oil, salt and pepper. Bake for 15-20 minutes. Remove the pan from the oven and do a temperature check on the meat. Depending on the size, it may take a little longer, but remove the pork from the sheet pan and cover with aluminum foil once the internal temperature reaches 145°. If the brussels sprouts are nicely charred and cooked through, remove those to a bowl and cover, too. Crank up the heat on the oven to 450°. 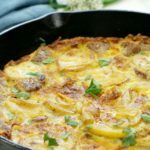 Flip the potatoes and return the potatoes to the oven. If the pork and sprouts need a little extra love, just be sure to monitor them so they don’t get overcooked. Cook the potatoes for another 15 minutes, until crispy. Once the pork has rested for ten minutes, slice it into rounds. 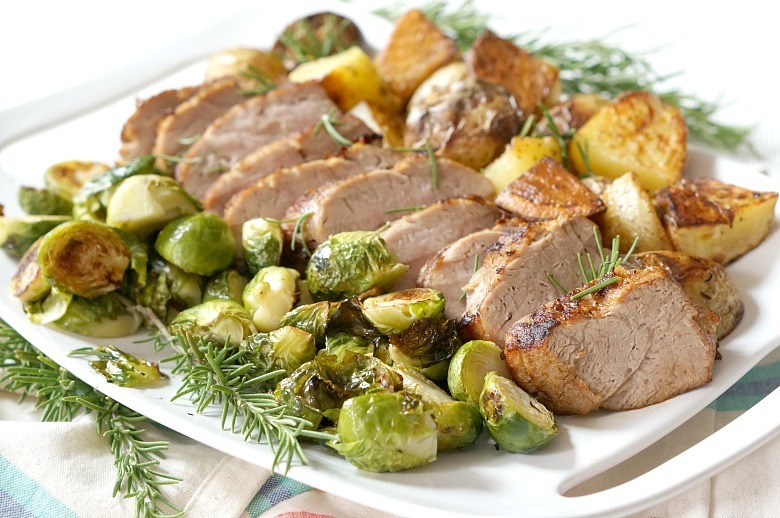 Serve the potatoes along with the brussels sprouts and pork. How perfectly crisp are those potatoes!?! Short on time? Skip the searing of the pork tenderloin and put it straight in the oven with the brussels sprouts and potatoes. 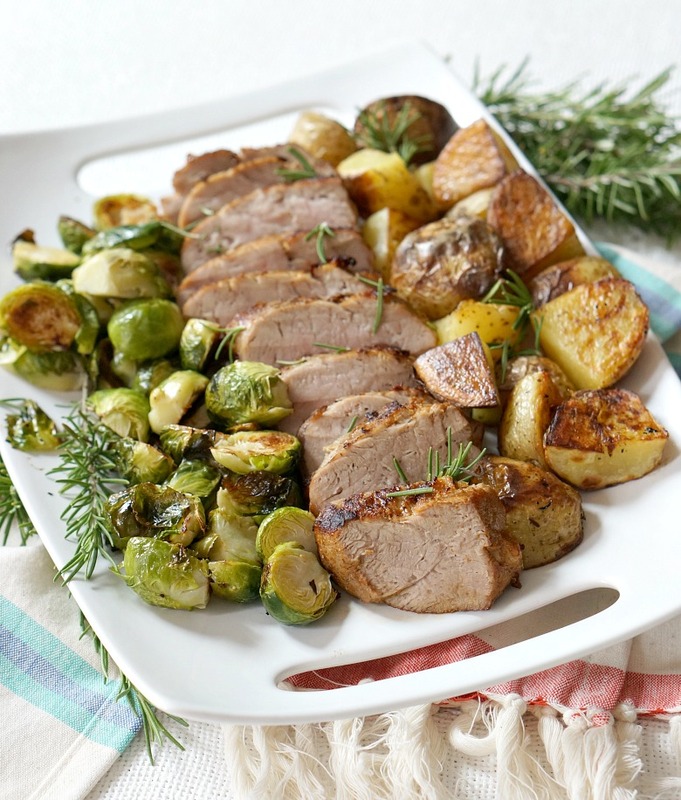 Then you'll only have just one pan for clean up with our Sheet Pan Pork Tenderloin Dinner! Preheat the oven to 425 degrees Fahrenheit. Toss the quartered potatoes with a drizzle of olive oil, salt and pepper. Scatter on one third of the baking sheet. Place the pork in the middle, and on the other side, toss the halved brussels sprouts with another drizzle of olive oil, salt and pepper. Bake for 15-20 minutes. Remove the pan from the oven and do a temperature check on the meat. Depending on the size, it may take a little longer, but remove the pork from the sheet pan and cover with aluminum foil once the internal temperature reaches 145°. If the brussels sprouts are nicely charred and cooked through, remove those to a bowl and cover too. 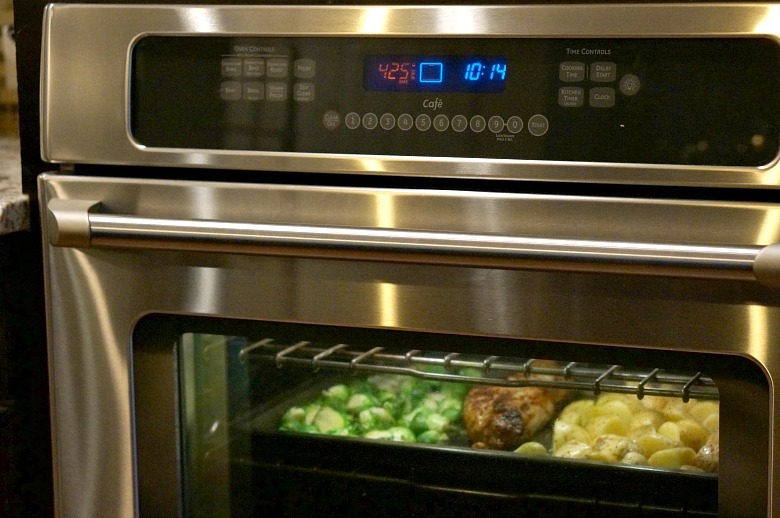 Crank up the heat on the oven to 450°. Flip the potatoes and return the potatoes to the oven. If the pork and sprouts need a little extra love, just be sure to monitor them so they don't get overcooked. Cook the potatoes for another 15 minutes, until crispy. Once the pork has rested for ten minutes, slice it into rounds. 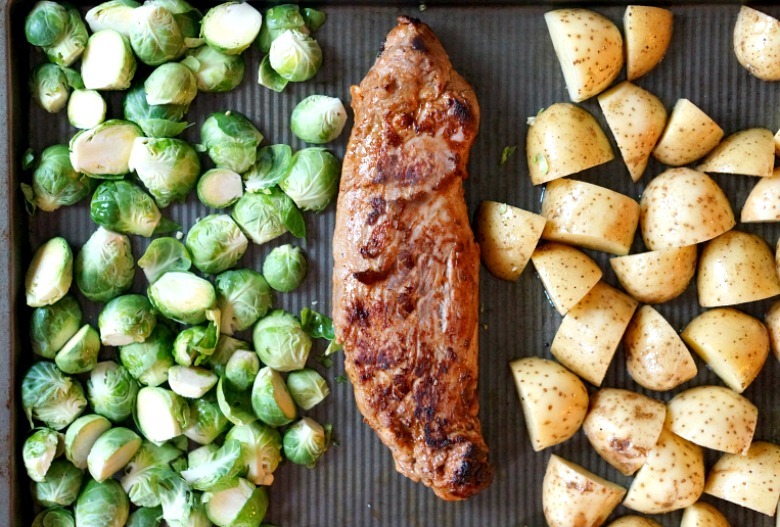 Serve the potatoes along with the brussels sprouts and pork. Scatter with chopped rosemary, if desired. 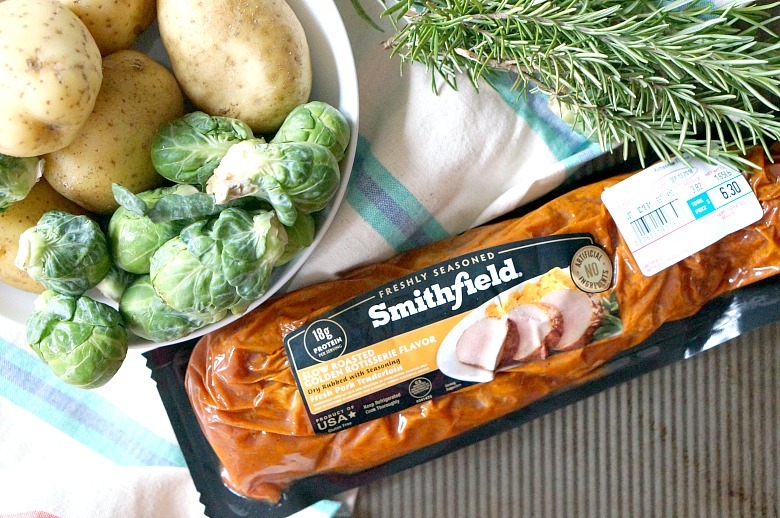 Smithfield Marinated Fresh Pork provides Real Fresh, Real Flavor, Real Fast… they provide real solutions for real life. 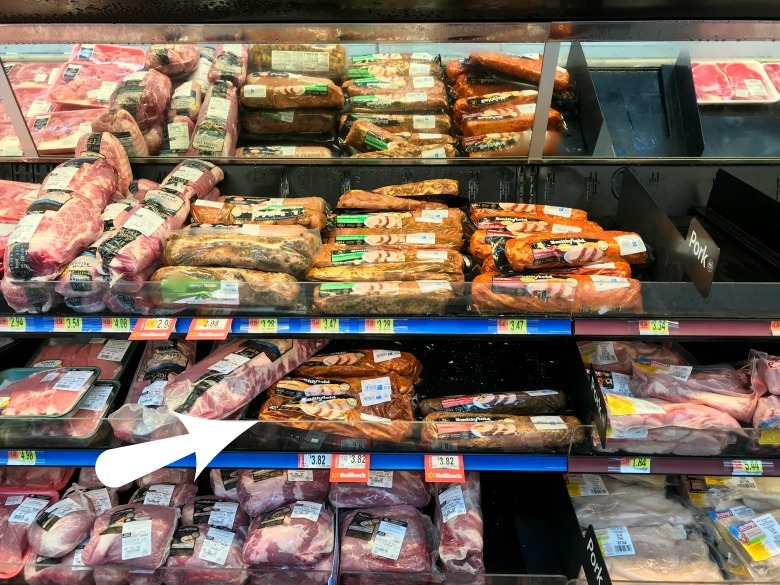 All of the ingredients, including the Smithfield Marinated Fresh Pork, can be found at Walmart. 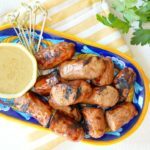 Earn $1 cash back on Smithfield Marinated Fresh Pork by visiting Ibotta today! 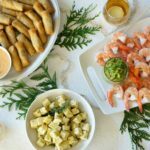 Looking for more great weeknight suppers? 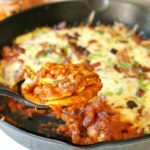 My family loves these not-so-spicy Tacos for Dragons and this Pasta Carbonara is ALWAYS a hit! I’m guessing you could! 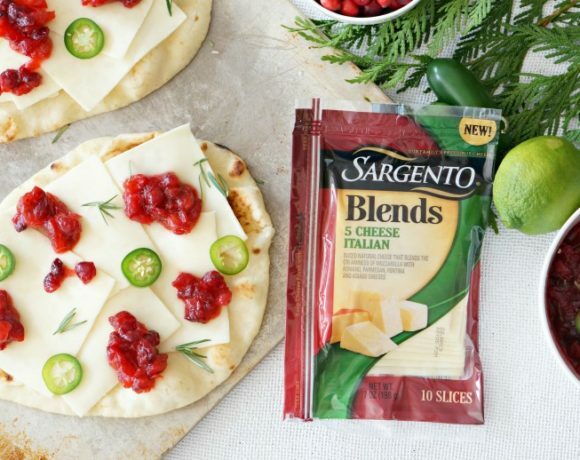 Seems like almost anything can be cooked in one. I haven’t done it, but I bet if you look up the timing for pork, everything else will turn out just fine. If you try it, let us know how it turns out. I wonder if you couldn’t cook the cut up tossed potatoes in the microwave until half way done and then throw the dinner together and put it in the oven so everything gets done about the same time. I bet that work! If you do it, let us know how it turns out. Thanks Glenna! Why does this recipe call for a ROASTED pork tenderloin ? It’s the name of the marinade that the pork is in when packaged. The product is actually raw, and we’ll be roasting it per instructions in the recipe. 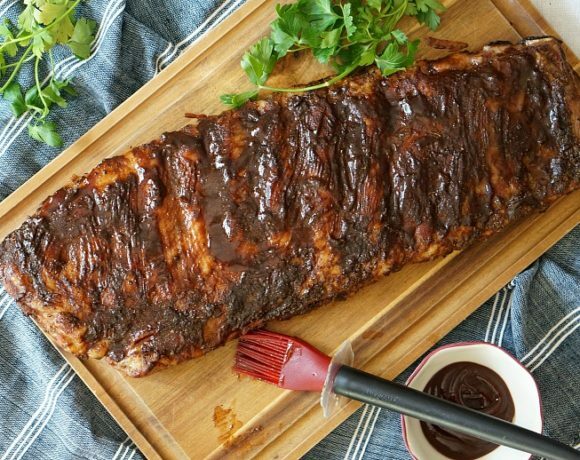 Is the pork loin raw or precooked and just heated up? When you purchase it, the product is raw.